The iOS 7 Beta 4 version is now released by Apple for the developer accounts and the devices whose UDID is included in the account and registered with Apple for the developer stuff. You can have the UDID registered through some of the services available, and then can try out the iOS 7 beta versions, and the Beta 4 is the most stable and best version till date and as expected, the newer the beta version the better are the features. 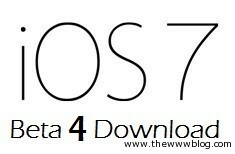 The iOS 7 Beta 4 can be downloaded by going to the following links and you have to inject the file for installation through the iTunes, the process which we would explain below after the download links. There are a few certain steps you need to follow and understand while trying to install the Beta 4 of the iOS 7 for your device. If you were already running the previous iOS 7 beta version on your device, it is pretty much easy to update it to the Beta 4, because you don’t need to connect it to the computer. Just ensure that the battery in that device is 50% and above, or is plugged in for charging, and then go to Settings > General > Software Update where the update would be available. If you have not used any earlier version of the iOS 7 Beta and are trying out this for the first time, follow these steps to install using the IPSW files. You need to have the UDID registered, or the process of installation would fail in the last step when the device tries to connect to the Apple servers for the device identification, because the beta version of the iOS 7 is still open for the developers and not for the general public.